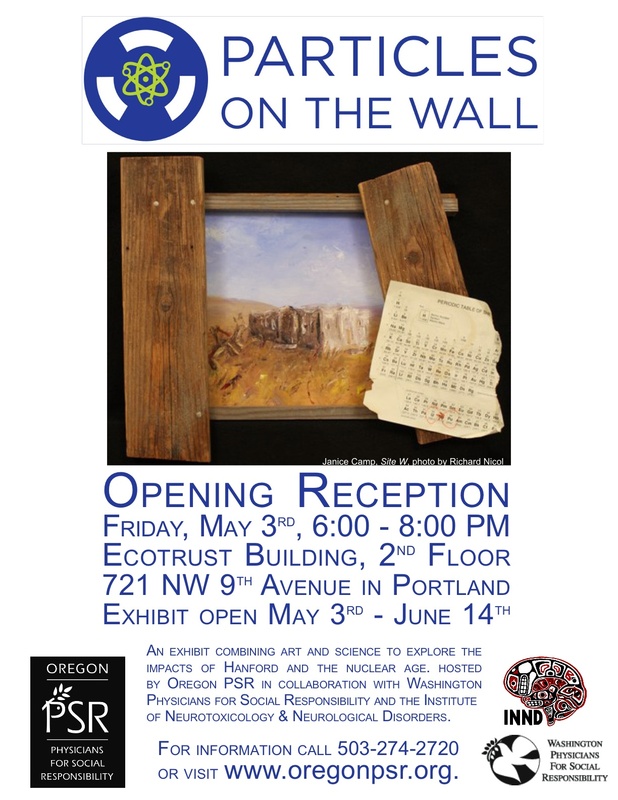 On Sunday, May 19th from 5:00-7:00 pm Oregon Physicians for Social Responsibility (PSR) presents an evening featuring artist stories and readings, discussion, and inspiration from the unique exhibit Particles on the Wall. This interdisciplinary exhibit explores elements of the nuclear age, science, and Hanford history. The exhibit, created by Washington based curators Nancy Dickeman, Dianne Dickeman and Steven Gilbert, interweaves visual art, poems, and science with history and memorabilia to address issues of radioactive contamination, nuclear weapons and technology in the Pacific Northwest, and their roles in the regional landscape as well as impacts on local and global communities. 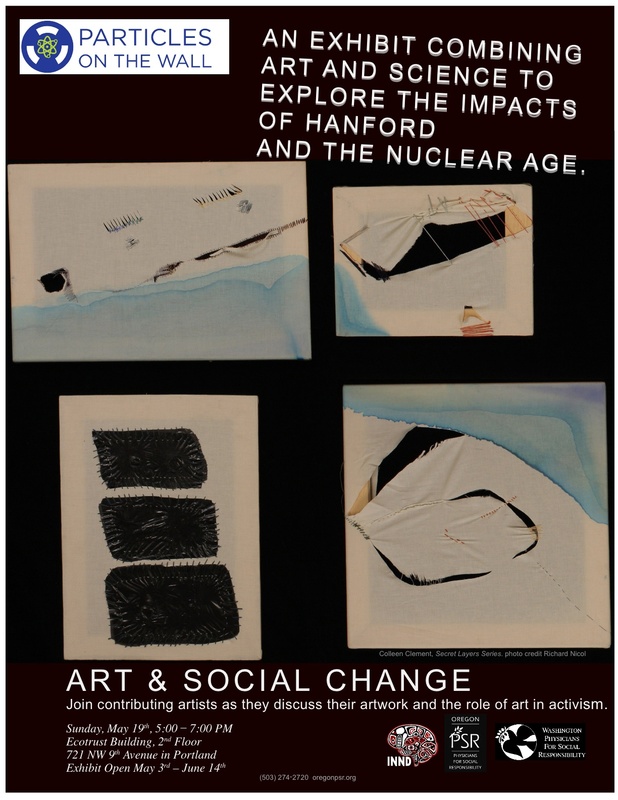 Oregon artists have now joined this important and timely exhibit currently showing at the Ecotrust Building in Portland, Oregon until June 14, 2013. Join us in welcoming Particles on the Wall curators and contributing artists from Washington and Oregon to hear them speak about their work, tell their stories and read their poetry. Artist presentations will be followed by a discussion led by artist activists Renee Mitchell and Chisao Hata on the role of the artist in social change. Particles on the Wall is dedicated to William Witherup, Washington Physicians for Social Responsibility’s first Artist in Residence, who passed away in 2009. Particles on the Wall makes its Oregon debut this Friday, May 3rd, at the Ecotrust Building in Portland. It’s a scaled-down version of the Richland exhibit, so I’m honored that my poems made it in. Opening night features an awards ceremony for the 5th annual Greenfield Peace Writing Contest for Oregon high school students who wrote about why Hanford matters. There will also be food, music, and wine in the house—do come by if you are in the area. Driving towards Hanford Nuclear Reservation from Seattle on some of the smaller highways, rolling green hills rise up around the Columbia River. Green because of spring, with patches of purple flowers, and I could forget that I was in Washington State, that somehow I’d been transported to a more arid Ireland. Along this route there is a place where the river is so placid and wide it’s a lake rather than a river. Along the way, there are small raised ridges in the river that mean dam—glass-smooth on one side, agitated on the other. It’s hard to imagine what the river was like before its power was “harnessed,” though I’ve read many accounts of its pre-dammed vigor, its force of life. Closer to Hanford, the landscape browns out a bit. It looks more like a commonly known Eastern Washington: dry desert, sage, straggly trees that have not even budded yet, sand and rock. Still, the green hills are in the distance, over the road and over the river, should one need to look at them for reassurance. My friend and I stopped for a picnic lunch by the Columbia, in sight of a boat launch that seemed to be popular with the fishermen by the number of trucks with empty boat trailers. We were across the bridge from the beginnings of the Hanford Nuclear Reservation. Here, when water levels are high, muddy water covers the rocks—when the water drops, the mud dries, coating the rocks a cracked, parched white. 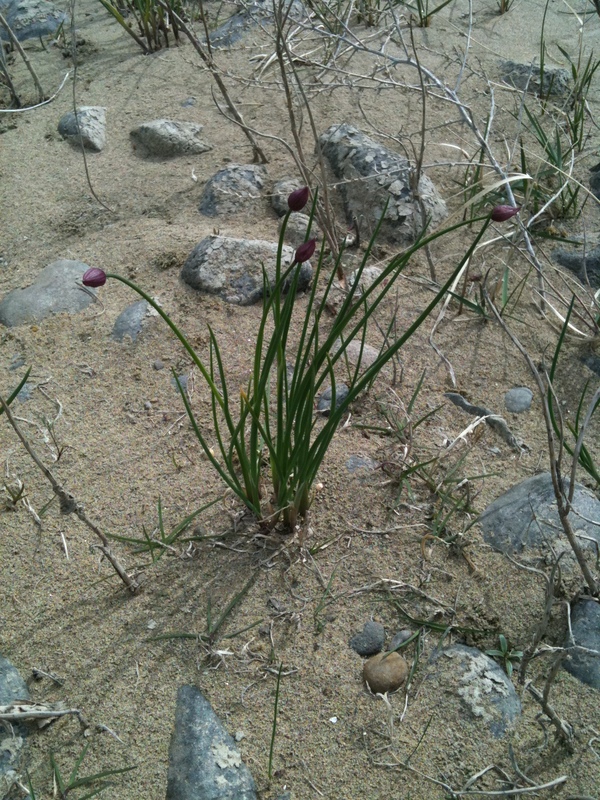 Here is where the wild onions grow, pushing up through sand and rock, their muscular, bright green tubes crowned with plum-colored buds, still in teardrop formation. I stepped through them carefully to wash my hands in the river. I eyed Hanford to the east. This isn’t Hanford water, is it? I noted the flow of the river; the current was moving toward Hanford. I wondered about all the fishermen, none of whom I could see, but who were out somewhere on these waters, presumably catching fish. I thought about swimming in the Columbia as a kid. I thought about the hundreds of gallons (and counting) of radioactive waste leaking just over there. Then I bent down to wash my hands. I was still thinking of the leaking containers—as well as the government sequester that threatens Hanford clean-up efforts—when we walked into the Art Center, located on the Washington State University Tri-Cities campus. In one corner I found Douglas Gast’s installation, 67 Are Confirmed Leakers (2008)—sixty seven (or so I assume; I didn’t count) small silver containers, glowing emerald from the inside. We often associate “toxic” with the color green—at least I do, growing up with Mr. Yuk stickers all over the house. Green is also often used in comics for any gross—if not toxic—substance. Yet green is also a color that brings comfort and relief, means newness and rebirth, like sprouts in the garden after a long winter, or the hills nearby. But what color is nuclear waste? The greenish color for all things radioactive may have come from Marie Curie, who noted that Radium glowed. Nuclear waste can be in the form of a sludge (which is what is leaking now at Hanford), rods, or in the form of glass, in a process known as vitrification. The containers of Gast’s installation in fact reminded me of rounds of stained glass, which then made me think of the image I came across on the Hanford website (also included in the exhibit) of spent fuel rods. I found the image striking, beautiful as moldings of old buildings—just as I found Gast’s neat rounds of green beautiful—which is at odds about how I feel about Hanford and nuclear waste. As a child, I dreamed about nuclear war. I’m not sure why—perhaps it’s something passed on from my parents, who were children in the fifties and remember well the Cuban Missile Crisis of 1962. My dad was born just three days after the US dropped atomic bombs on Japan, an event that seemed to frame his life, just as the Cold War framed the beginning of mine. At the exhibition, I met my parents and my sister, who had driven down from Spokane. While we absorbed the art and read poems, scientific facts, and personal tales, my parents also shared their own stories. They talked about bomb shelters. As a kid, my dad didn’t have one; they were going to tough it out in the basement, which somehow made my dad feel, well, tough. My mom said her family joked that her dad would forget the can opener, and they’d have no way to open all the canned food he meticulously stored. It was a great honor for my two poems about fallout to share the walls with so many fantastic works of art. I was struck by the fearlessness of these artists, and how their work manages to straddle the everyday and the surreal—such is life near the nuclear reservation. There were poems by Kathleen Flenniken, Washington State’s Poet Laureate, who grew up in Richland as a child of a Hanford worker. 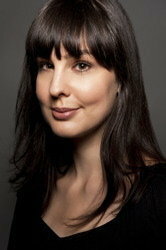 She later worked at Hanford herself as a civil engineer before turning to poetry. Her experiences surrounding a life both in and near Hanford are the subject of her amazing book, Plume. Brooklyn artist (and Washington native) Eric LoPresti’s painting Flashhouse (2012) reflects the stark landscape surrounding Hanford and suggests houses near testing sights, used to ascertain the effects of a nuclear blast on a common home. Sherman Alexie’s “The Powwow at the End of the World,” made for a powerful end of the exhibition (or beginning, depending on which way you go). Poems by the late William Witherup, to whom the exhibit was dedicated, wove through all these works, a thread or undercurrent that pulled the exhibit together. He lived downriver of Hanford much of his life, and in 2009 died of the leukemia he believed he had developed because of this. His work focuses on the people living near, and especially downriver from, the nuclear reservation—and the effects that Hanford has had on these lives. Anything nuclear still seems mysterious to me. The more I learn, the more elusive it is. Maybe it has to do with radiation being invisible, odorless, helpful, and harmful—indeed a mysterious entity that can take on many forms or no form at all. Maybe it’s something in me that refuses to absorb the process of bomb-making. Maybe it’s fear that keeps me from understanding. But none of this keeps the city of Richland from embracing its atomic history. Residents don’t seem to be afraid to be hemmed in by the most contaminated nuclear site in the United States. Richland High School answers to “The Bombers”—and not that long ago, there was the Tri-City Atoms Northwest Baseball League. (This t-shirt was in one of Bill Witherup’s desk drawers.) Walking out of the exhibit, the car parked beside ours had the bumper sticker, “Radiate Peace.” And the brewery where we ended up boasted that the radioactive water is what makes their beer so potent. It’s enough to get one to loosen up about the whole nuclear thing. Even so, I was glad to begin the drive back west—to let the Hanford Nuclear Reservation go by, and to set my sights on the green hills in the distance. Rest in Pieces: Bess Lovejoy’s book launch! Finally! Bess Lovejoy’s book, Rest in Pieces: The Curious Fates of Famous Corpses, is coming out on Tuesday, March 12–and there’s going to be a big launch party at the Rendezvous Jewel Box Theater in Seattle. Not only will there be a reading and a book signing, but rumor has it that there will also be a guest skull or two. I can’t think of a better excuse to raise a glass. Na zdraví to Bess and to all those dead folks! Two of my poems will be shown along with many other works about all things nuclear in the exhibit, Particles on the Wall. If you happen to find yourself the vicinity of Hanford and the Tri-Cities, do pop in the WSU Art Center. 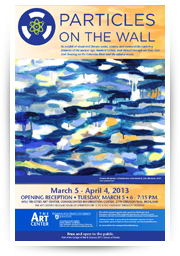 The exhibit is free, and runs through April 4th.